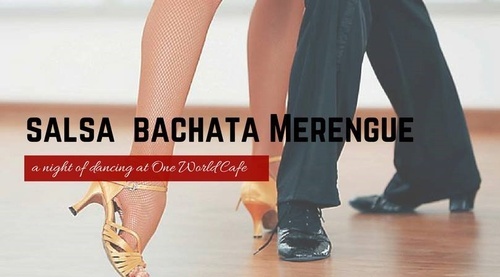 One World Cafe is excited to be putting on a night of Latin dancing every third Friday of the month! A beginner lesson will be taught from 6:00pm-7:00pm, taught by local instructors Annelise Nielsen and Daniel Reiss from Salsa on the Palouse. They will cover the basics of salsa, bachata, and merengue, and they'll teach you what you need to know to get out and dance. After the lesson, the floor will be opened up for social dancing until 9:00pm.